Remember what Clifton's Cafeteria looked like the early '60s? 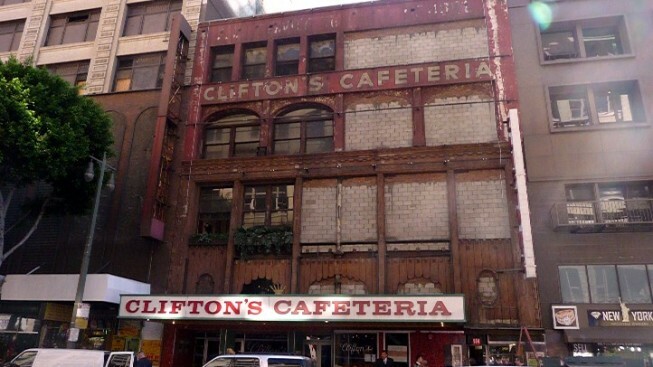 The Clifton's Cafeteria facade, unseen since 1963, was revealed during renovations on Wednesday, Feb. 8. Things hidden underneath other things? LA certainly possesses a knack for concealing her surprises. And nope, we're not talking about the methane pockets that hiss under much of the Miracle Mile District, nor are we referencing our various shake-prone faultlines. We're talking manmade structures here, and we're talking specifically about Clifton's Brookdale Cafeteria, one of our city's most historic restaurants. Heck, Clifton's is one of our city's most historic fill-in-the-blanks. We all pretty much love Clifton's, it is true, for its affordable dining, its woodsy interior, and that famous wobbly red gelatin (please feel free to fill in your own reasons, if you like). So news that the nearly 50-year-old grate that had long covered up its vintage, art-deco facade finally came down is a relief to many. The suspense-filled reveal happened on Wednesday, Feb. 8. The de-grating of the restaurant's Broadway-facing front is part of the major renovations the cafeteria is currently undergoing. Clifton's was bought by Andrew Meieran in 2010, the man behind the flickering lamps and copper-cool downtown bar The Edison. Mr. Meieran, who is also a filmmaker, will be bringing a few changes to the born-in-1935 Clifton's, like a tiki setting on the third floor. It's an homage to the long-gone Pacific-themed Clifton's that once called Olive Street home (there were once multiple Clifton's, you might recall; the Broadway cafteria is the sole survivor). We'll miss the bordello-flocked feel of Clifton's third floor but we can't object to a stylish callback to a now extinct restaurant. And seeing that beautiful, kidney-red facade finally see daylight again? It just feels like the cafeteria is regaining a bit of its 1935ness. Yay that. We make no quibble with midcentury design, unless that design obscures a 1930s front which was already lovely to begin with. Agree? Then follow other initiatives to save the treasures of that stretch at Bringing Back Broadway. Now. How else will you regain your 1935 swagger, dear Clifton's? We are prepared to be charmed further. Feel free to work your woodsy, rustic, wobbly-gelatin magic on us.